The first-line center position was once the most recognized spot in hockey. This is true from years of research and science. Well, it’s not really that detailed. From 1972-73 through 1995-96, a non-center won the Hart Trophy just three times. Since then, centers have won the Hart seven times. Does this mean their value has waned? Not at all. In fact a center is more valuable than ever before. They are multi-layered, multi-zone organisms. You cannot have a second-line center playing 1C minutes and expect to win a Stanley Cup. There are just different ways to measure their importance than the past. 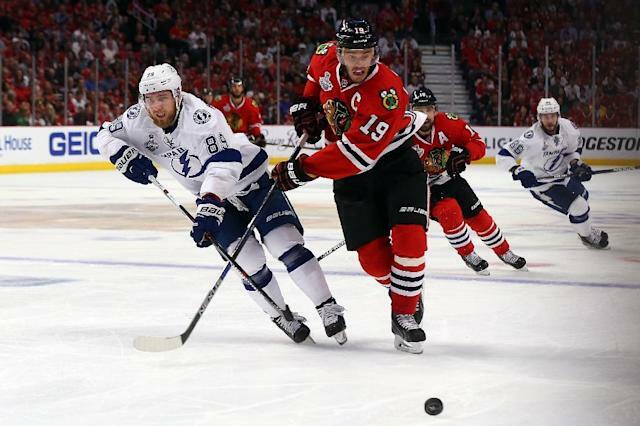 This past season, Jonathan Toews’ CF Rel% 5-on-5 was at plus-3.84 according to Natural Stat Trick – best on the Blackhawks amongst regular players. Anze Kopitar was plus-4.68, third on the puck-possession heavy Kings. Patrice Bergeron was plus-9.78 on the Bruins. Sidney Crosby and Evgeni Malkin were both in positive territory at plus-5.27 and plus-3.91, respectively. In the age of advanced stats and analytics, a center who can control the pace of the game and keep the puck in the other team’s zone is vital. And a middleman doesn’t have to have high-level point success like Crosby, Malkin or Steven Stamkos to do this, though hitting about 60-70 points in a season is probably the norm for an elite 1C. You need a first-line center who can skate. You need a first-line center who can play well in all zones. You need a first-line center who can win over 50 percent of his face offs, or at least that's a nice bonus. Toews has played Kopitar and Bergeron in the playoffs. Against an elite center, you’re not going to just have to battle him in the offensive zone. The compete factor goes all over the ice. There are other skaters at different positions who have been recognized recently to a high degree. Wingers have won four Hart Trophies since 2008 – three for Alex Ovechkin and one for Corey Perry. Patrick Kane could have been a Hart Trophy possibility this year had he not gotten hurt in February. Also, it’s hard to say defenseman Duncan Keith wasn’t more important as Toews for Chicago’s Stanley Cup win this year. But even those who play in other spots understand the importance of a strong center foundation to overall team success. Centers Connor McDavid and Jack Eichel, the No. 1 and No. 2 picks in the 2015 NHL Draft are seen as potential building blocks – not just because of their offense, but because the Oilers and Sabres won’t need to worry about strength down the middle for the next nine years at least – those two will leave Edmonton and Buffalo at some point dadgummit! The Arizona Coyotes took center Dylan Strome with the No. 3 pick in 2015, probably in part because of his position. Seriously, who wants Noah Hanifin? Remember when defenseman Seth Jones fell in the 2013 Draft to Nashville at No. 4? That was in part because Colorado wanted to take the draft’s best center, Nathan MacKinnon with the No. 1 pick and the Panthers wanted a middleman in Aleksander Barkov at No. 2. We still don’t know what Tampa was doing with winger Jonathan Drouin over Jones at No. 3, but that’s another story completely. To make a cross-sport reference having a top center in your lineup for the long term is almost like the Indianapolis Colts scoring the No. 1 pick in the NFL Draft when first Peyton Manning was available and then Andrew Luck. They’ve mostly had success with either QB in the lineup. When you can pencil in an elite player at an important position every game, everything goes much easier. Find the right guy to plug in at center 82 nights out of the year and watch your success grow. It’s the best way to build in today’s NHL.